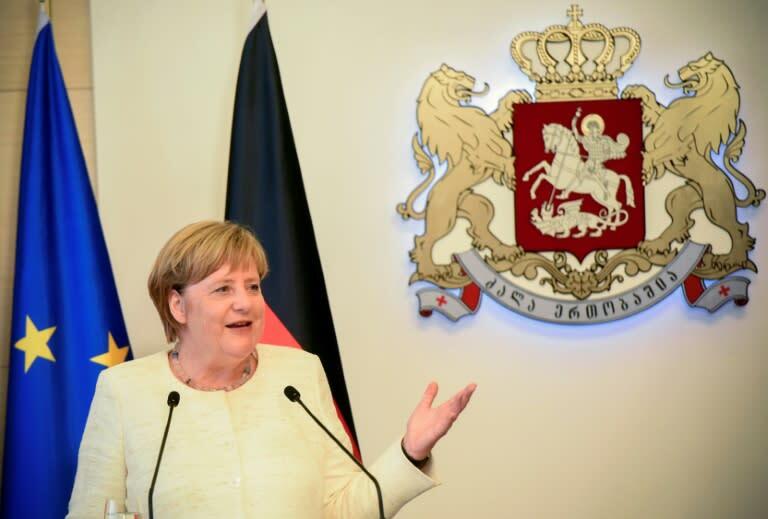 German Chancellor Angela Merkel on Thursday reaffirmed support for Georgia's territorial integrity on a visit to Tbilisi a decade after a Russia-Georgia war led to Moscow-backed regions breaking away from the Caucasus nation. "During my last visit to Georgia 10 years ago, I demanded the withdrawal of Russian troops," Merkel said at a news conference in the Georgian capital on the first leg of a three-day trip to the South Caucasus. Today, "of course, I am standing by Georgia's territorial integrity," she added. Merkel last visited Georgia in August 2008, a few days after an EU-brokered ceasefire ended Russia and Georgia's armed conflict over the Moscow-backed breakaway South Ossetia and Abkhazia regions. After the five-day war, Moscow recognised the two enclaves that constitute 20 percent of Georgia's territory as independent states and stationed permanent military bases there. On Friday, Merkel will travel to Armenia and on Saturday to Azerbaijan, where she will encourage "a peaceful and consensual solution" to the two countries' long-running territorial conflict over the Nagorny Karabakh region, her office said. In Azerbaijan she is expected to discuss energy cooperation with the oil-rich Caspian nation which is seen as an alternative to Russian supplies of natural gas and oil to Europe.